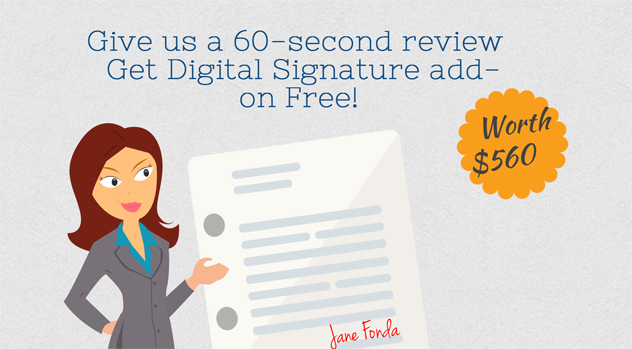 Get us a 60 seconds review & Get Digital Signature Add-on worth $560 absolutely FREE! Home/News & Announcements/Get us a 60 seconds review & Get Digital Signature Add-on worth $560 absolutely FREE! Grab your mobile or tablet and snap a 60-120 second video of yourself reviewing Docsvault. As an appreciation for your time and honest review, we will give you our Digital Signature add-on (a $500 value) + 12 months subscription (a $60 value) absolutely FREE! Our Digital Signatures Add-on gives you the convenience of signing your documents digitally right within Docsvault without having to print, hand sign and rescan them back into the system. This saves you a lot of time and speeds up approval processes while adding tamper proof security to your signatures that are both legally binding and even comply with regulations. You get the power to sign your documents digitally and we get honest reviews that can help potential customers with their decision making. To learn more about digital signing in Docsvault visit our Digital Signature features page. Send us your video by Friday 31st October, 2014 in order to take advantage of the above offer. The offer includes the initial onetime cost for the add-on of $500 and an annual one user subscription of $60. Call 1-888-819-3035 for more information.